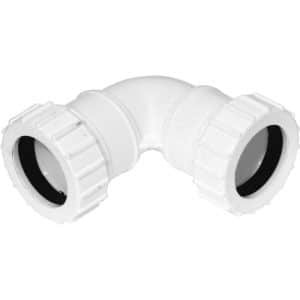 EasyMerchant keeps in stock a large range of plastic waste pipe and fittings in all sizes, colours and connection types including solvent, compression and push fit in black, white and grey. All are kitemarked and approved for use in the UK. Chose from our Solvent Waste, Push fit Waste, or Mechanical Waste Systems. Available in white, black and grey and in sizes 32, 40 and 50mm. All of our waste pipe fittings are UK made and backed by a British Kitemark certificate to prove their quality. Water that comes out of your appliances flows through the pipes, be it solvent, push fit or mechanical and out into to the main soil stack, and from there it goes right into the underground drain (or in the event of a ground-floor sink, basin or appliance) or it could flow to a trapped gully that's connected to the drain and fitted with a metallic or plastic grid to prevent debris and leaves from obstructing it and falling into the trap. The drain itself will likely then run to a pit or to the sewer or septic tank buried in your backyard. All household appliances will be connected from the trap to the soil stack. The most commonly sold and installed variant is the solvent waste system. This is because once installed it provides the strongest - longest lasting connection of all the different variants. 21.5mm: for overflows from boilers or cisterns. 32mm: Found under low volume outlets and small hand basins. 40mm: for kitchen sinks and bathroom waste pipe. 50mm: Usually found in industrial buildings, but can also be seen in residential houses. 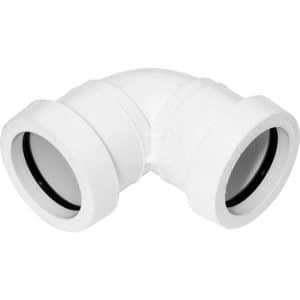 110mm: For sewer drains and soil pipe. As a guideline, you should stick to one system in your house and be constant throughout. Compression fittings are the exception to the rule, because they are typically universal and may be employed on either solvent pipes (43mm external diameter) or even push-fit pipes (40mm external diameter). As the compression fittings are tightened, they'll secure the pipes using watertight rubber seals. 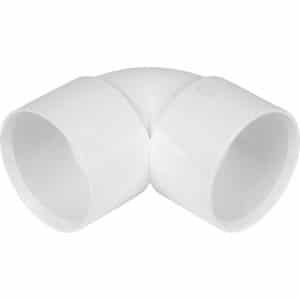 These fittings are best for linking different pipes together. The principal disadvantage of these fittings is that they're bulky and expensive it's ideal to go throughout the entire home with either solvent or push-fit systems and be consistent where possible. Solvent pipes are not removable and adhesive. Push fit pipes push together and are coated using a rubberised o-ring, these must pull apart very easily. Compression fit connections usually use before they can be taken off, a twist lock link that must be un-tightened. Solvent waste does however require a slightly more intensive installation over for example the push fit system which simply pushes together - as solvent waste joints will require proper preparation and then for solvent cement to be applied and left to dry for 24 hours. The mechanical or compression waste system offers the best of both worlds. It's easy to install and adjust and also provides a very strong seal, however the compression waste system does come at an added cost due to the additional parts required during manufacture. At EasyMerchant we try to bring you the highest quality items at the best possible prices. We also want to deliver them to you as quickly and accurately as possible. That's why we're sure you'll be pleased with any of the waste pipe systems on offer and return again the next time you're in need!